The community where I live has an event the first Friday of each month called “First Fridays.” Businesses along one of the main traffic corridors stay open late, local musicians provide entertainment, and local artist exhibit their works in what used to be an old furniture store. It's quite fun (and mostly free). Last December some friends and I went to First Fridays as a festive kick-off for the Christmas season. We dressed in Christmas attire, went to the tree lighting, had pictures taken with Santa, the whole sh'bang. But I think one of the more memorable moments was at the gallery. 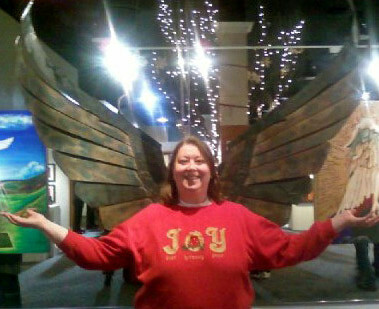 One of the local artists had displayed a pair of ginormous bronze wings. I thought they looked cool, but they would look more cool if they were angel wings, so we took turns with the cell phone camera, and now we have angel pictures of ourselves. Right now as I write, it's early October, pre-Halloween. Alongside of the rows of trick-or-treat candy and costume accessories are rows of Christmas decorations and housewares, with likenesses of Santa Claus, gingerbread men, snowflakes, and angels. It seems we only see angels among us during November and December. Is that the only time God allows these heavenly beings He created to breach the veil between heaven and earth? What do they do when they're not adorning our Christmas tree? Does God pack them away in a box when January rolls around? Thankfully, God created angels with a purpose that does not know seasonal limitations. He created them to be His messengers to carry out His business in the world. They can be here one minute, warning us, embodying God's love for us, or filling a desperate need for us, even executing God's judgment against us (as in the book of Revelation), and then be gone then next. Although they may appear visibly or be heard audibly, they usually perform their duties as invisible, yet very real, agents of God. Most of the time angels are depicted in our modern culture as young women in wispy full-length gowns and delicate wings. Personally, I don't fully buy into that image, and from what I've read in Scripture, God doesn't want us to limit them to that view either. Sure, God can command an angel to minister to us in the form of a bystander giving words of comfort to someone going through a tough time. But when it comes to protecting us or defending us from the schemes of the devil, I'd much rather have God employ angels that are more characteristic of highly trained American soldiers than three chick friends standing in front of a bronze sculpture! I would not want to begin what kind of evil and terror we would go through if God's army of angels did not watch over each and every one of us! A discussion about angels and the theology behind them can be very long and very deep. Friends may have at one time or another considered me as an angel, but that does not make me one, nor am I an expert by any stretch of the imagination. For in-depth reading on the subject, I recommend Angels by Billy Graham (Thomas Nelson / 2000), and Angels: Who They Are and How They Help... What the Bible Reveals by David Jeremiah (Random House, Inc / 2009).